Simon Notley could be described as a man with a mission.. He’d like to encourage people to see timber as the right material for building a house or an extension, not just as the ancestor of bricks and mortar. His company, Townsend Timber, has come on somewhat from the time some friends asked his father if he would come over and put a fence up for them, which he saw as being a business opportunity to plug the gap until his farm picked up again. The business plan? “I finished at grammar school and joined dad as his labourer,” Notley says. “I had seen tenant farmers such as my parents working really hard but with little return. I thought if I’m going to work all the hours possible, that’s fine, but let’s make some money out of it.” At the time, we’re talking about the 1980s, he saw it as a stepping stone before family plans to consider emigrating went ahead. Notley taught himself carpentry, computer skills, indeed how to run a business, with his parents’ advice always in his ear. Which gave him sufficient nous to realise that as the business began to grow, he needed some formal coaching to avoid really steep learning curves. Instead of trying to compete with the DIY giants, Notley focused on producing what he describes as robust and durable garden sheds that will last for forty years and which his own assembly team put up for the customer. “My grandfather used to say don’t buy a cheap cow; a better purchase will pay a dividend even if it means it puts you under some short term pressure,” he explains. When he took over as managing partner in 1994 he felt an obligation to make sure the business looked after his parents. “It’s a farming tradition,” Notley explains. “We hadn’t just been business partners, there were obvious emotional ties, so there has been a blurred departure for them rather than it happening at a specific time. I always remember overhearing my father telling someone at a county show that he wasn’t doing as much as he used to but he liked to keep his hand in! In fact he only stopped coming into work a couple of years ago. The advantage has been that if a bit of a problem comes up, I can chat it over with them over a cup of tea and their involvement means they would know what I’m talking about. There are times that has helped me back onto the saddle.” On a more formal basis, Notley now has a mentor he meets up with every six weeks and who also serves as a sounding board. Whether it was innate ambition or an opportunity exposed by the Channel 4 programme Grand Designs, Notley decided that as well as sheds, fencing and conservatories, the company could be producing oak-framed buildings using time-honoured techniques. There are now oak framing products on the market which are thirty, even forty per cent cheaper, but Notley says there’s a fundamental difference even before he gets on to quality. Because they are mass produced, rivals are selling buildings which he says are visually characterless because everything has been machined to a specific dimension, and that goes against the true nature of oak-formed construction. Although the internet provides a shop window without geographical restriction, realistically there’s a good reason why Townsend Timber primarily work closer to home. The actual construction and assembly is undertaken at the customer’s premises by their own employees rather than sub-contractors. “London is our Holy Grail as a market, but the additional logistics come at the cost of margin,” muses Notley. Somewhat extraordinarily for a company with less than twenty staff, Townsend Timber have invested in lean manufacturing. “We did a footprint plan and realised that if we moved things around we could improve the productive use of the shop floor by some 75%,” Notley reveals. 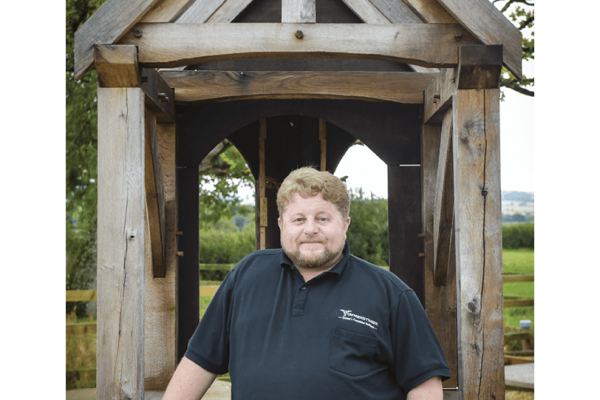 The company has a neat catchphrase – Timeless timber construction from Dorset’s carpenter builders – and Notley is aware of the need to have employees with the skillset to turn premise into delivered promise.